Best of all, it's FREEWARE! Enjoy! 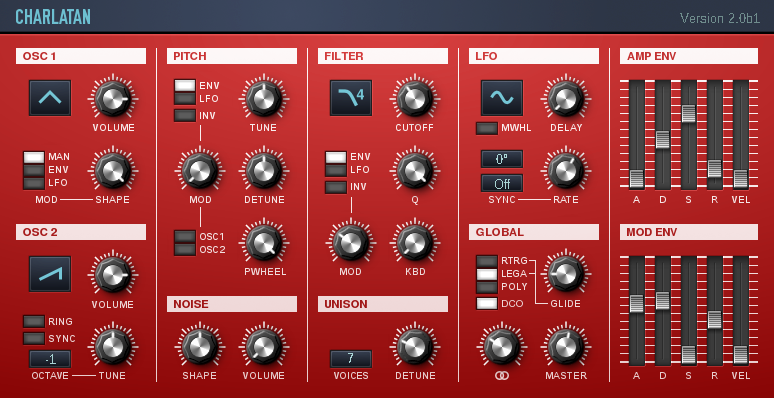 Please note that many of the presets are already included (maybe slightly modified) in the official releases. More banks can be found at the KVR database. If you want to share your presets, please upload them there. Also, many exciting songs made using Charlatan exclusively are the submissions for the KVR One Synth Challenge (OSC) 33. Discussion about Charlatan takes place in the Instruments sub-forum @ KVR audio. If you have questions or suggestions, post them there. You can also contact me at KVR via private message (username karrikuh). Note that I don't take any responsibility for any damage you might experience from using my plug-ins, so use at your own risk!